Big List of Latest 2013 - 2014 Seminar Topics and Presentation for Computer Science (CSE), Information Technology (I.T), MCA, MSc, MS, Electronics and Communication (EC), Mechanical, Electrical and Electronics (EEE), Instrumentation (IC) and Civil Engineering students with PPT and Abstract based on technical IEEE articles and journals. 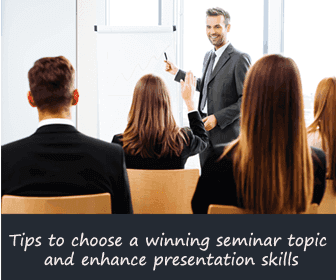 This collection of interesting and informative seminar topics will help you to give out a life changing presentation. All downloads are free. While selecting topics, first thing that comes to the mind of the presenters is "How to give an effective paper presentation ?". At a granular level, answer to these questions depends on multiple parameter's. Success of seminar depends right from choosing the best topics, finding right materials to make a PPT, speaking on interesting and engaging aspects of the subject to better audience engagement. Based on your audience profile, a seminar can be based on a thesis, motivational subjects or on advanced technical topics based on IEEE Papers. Now let us have a look at the important aspects that can help you in giving effective seminar. It's a common practice that your Professor or Guide ask you to choose a topic that is trending and unique. This make it hard for you and ends up selecting subjects that have less materials available in public. In order to avoid this scenario, choose topics which are unique, but for which materials are available. It will be good to have a look at IEEE Journals, because IEEE papers will be backed by good materials and case studies. During presentation, include case studies and explain the implementation and its use in real life applications. Also, try to analyze recent trends in various fields of engineering. To get hot topics, attend conferences and workshops, listen to technology news and read articles on future technology. Make sure that topic you select, interests and excites you. When you are passionate about a subject, you will go an extra yard to know more about it. Moreover, you will be able to speak fluently about the topic and helps you answer queries from attendees. If you are a fresher, you will be able to impress the interviewer with your knowledge about the topic during campus placement. During topic selection, you should check the reach of the topic. If the topic you choose is very well known, diverse areas of the same topic can be selected by multiple participants attending symposium or workshop. So do your research and check with you colleagues about the uniqueness of the topic. Also, check your college directory and make sure that the topic you select, was not taken in the past years. You can take the help of experts, to find unique content. It's a common mistake that, presenter choose topics which have wide range of use. This will lead to vague presentation without having in-depth information about each content. When questions are asked on the subject, you will have a difficult time answering them. In order to avoid this scenario, choose topics that are very focused. You should select a particular area of the topic and explains it well. Make sure that your topic is not too technical. Audience tends to lose interest in the seminar, if you talk only about technical aspect of the subject. For a presentation to be a success, you should have participation from audience. For that, topics you select should excite audience. They should feel that, attending this seminar will help them improve their knowledge about the topic. During seminar, use real life examples to back your idea. This will have a big impact on audience to understand the topics well. Also, you should modulate you voice, in order get attention from the audience. If you are monotonous, people will get a tendency to sleep. To engage audience, you can plan for an open discussion or Q&A session at the end of each sub topic. After selecting excellent and engaging seminar topic, presenter often mess up the during actual presentation. This often happens due to lack of rehearsal before the event. It will be ideal if you rehearse your lecture three to four times before the actual event. This will help you find and analyze the gaps. If you can record video or audio of your talk during rehearsal, you can playback and analyze the gaps. It will also help you choose appropriate words if you find some were inappropriate during playback of your presentation. You can't incorporate everything you are going to discuss in the slides. Only major points about the topic are written in the slide. So there is a greater chance that you miss the key details while presenting. In order to avoid this scenario, prepare a handwritten short note of the items you are going to discuss in each slide. Use the notes as a reference. Don't read out from the notes. A presenter can mess up a seminar due to the fear of public speech. Most people experience fear during public speech. It's not easy to get rid of it. But your can overcome this by practicing following steps. To start with, talk to small audience. It can be your friends or colleagues. Be confident about your topic. Don't make eye contact with a single person for not more than three to five seconds. Often change your visual contact with audience. You should do research on type of audience you are expecting during conferences and workshops. If you are giving a lecture for Students, Teachers or Programmers, your talk should be more technical in nature. If you are addressing business people, seminar should be crisp and to the point. You should give an overall idea about the topics and concentrate more on the financial aspect of the product or business plan you choose for your idea. If you are interacting with audience who are not fluent in English, you should have more slides with graphics so that ideas are conveyed in a much better way. Also, you should talk slowly so that audience can pick it up. Use tools such as Microsoft Office PowerPoint, Apple keynote, Prezi or SlideRocket to make beautiful and graphics oriented presentations. If you are an open source person, go for tools like Prezi, Zoho Show, EWC Presenter etc. You should reach location, 15 to 30 minutes in advance. You should use this time to boot up your laptop, check the connectivity with projector. Setting up projector usually takes time and you might need to do some research to adjust the resolution in projector. Audience will have wrong impression about you, if you are setting up the projector in front of them. Try to use a laser pointer to highlight key points in your slide. Plan your talk between 9AM and 12PM. According to studies, it is the best time to get maximum attention from attendees. You should wear formal outfit while giving presentation. Don't wear flashy dress or ornaments. You should maintain a confidant posture through out your presentation. Don't look down. Try to move around a bit rather than be a statue. If you got struck at some slide, try to move to the next slide. Don't think about the slide you missed, else you will lose confidence and entire session will be a flop. If you are not able to answer any questions from the audience, just convey that you will get back to them once you go through more documents on the topic. Get their email, so that you will look genuine. If the venue is not taken into account, you are in for few surprises. Presentation generally takes place in a conference hall, training center, auditorium or in a classroom. If you are going to give your lecturer in first three options, all the facilities required to conduct training will be available. If you are giving your presentation in a classroom, you should take into account the positioning of your projector, sound system and where you stand. Since classrooms are small compared to conference hall or training center, projector should be positioned in such a way that audience is able to see the slides from all the positions. Also, make sure that you don't stand in between your audience and display. Don't use mic if you are in a classroom. Many people think that their job is done once they give out their seminar. But without proper feedback, you can't access the impact of your talk. Conduct a round table discussion on the topic at the end of your presentation. It helps you understand your shortcomings, expectation of the audience and garner new ideas on the topic. Try to implement the positive suggestions in your next talk and device a strategy to improve audience engagement based on the feedback. Hand over a feedback form to your audience and ask for their valuable inputs. What if you had done your homework well and went into a conference room expecting a huge audience and it turns out that only few had turned up, you will get demoralized. There might be a variety of reasons for the low turnout. But if the low turnout is due to unawareness of the event, its clear case of communication failure. In this era of social media, reaching out to your audience and generate a hype around your talk is not a big job. If your talk is good, social media will help you get a positive feedback and enhance your reputation. Future presentations can be broadcast live to your followers via Google Hangout or Skype. Every Year, IEEE publish lot of papers in the field of Science of Technology. You can subscribe for IEEE membership and get access to these papers. These papers are written by various scholars in the domain they work. Papers will be very descriptive and informative. Topics based on IEEE papers are very well respected around the world. Higher education students can make use of these IEEE papers. To discuss latest topics in the field of Engineering, Science and Technology visit our discussion forum. Individual users can rate a Seminar. Highly rated topic will be listed at the start of the page. Rating can also act as a motivation and recognition for the person who had uploaded the paper.